Shift Cables for 2002-2006 R53 MINI Cooper S and 2005-2008 R52 Cabrio S. Over time the shift cables in your Cooper S can break, have the rubber in them fall apart, or have the seals go bad and freeze during the winter. Please put your VIN in the notes section when you check out so we can make sure we are sending you the correct parts. Make sure you also select the shifter box you have in your MINI. 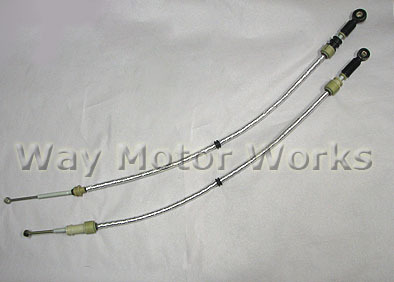 Sold as a pair, call to order an individual cable.